IPMR understands that electric motor repair is a critical part of your business’s operation. Motor-related downtime can idle production lines, reduce productivity and throw schedules into disarray. With so much at stake, your electric motor repair services contractor has to provide quality repair and outstanding customer service. From AC electric motors used for small, special purposes to those driving large-scale industrial machinery, IPMR offers the capability, reliability, experience and customer service you need in your drive for operational uptime. Every aspect of our AC electric motor repair shop, from electric motor rewinding to electric motor part repair is performed under the strictest quality standards. IPMR quality AC electric motor repair includes disassembly, detailed inspections and measurements to identify electrical and mechanical damage. All mechanical repairs on shafts, bearing journals, end bells, etc., are handled in-house by experienced machinists with over 150 years of combined experience. Old AC motor windings are stripped in a temperature controlled burnout oven to prevent efficiency loss from lamination damage. Motors are then rebuilt using the highest quality wire, insulation, and varnish materials for long-lasting repairs in the most severe industrial environments. Each repaired AC electric motor is tested for correct electrical and mechanical operation. Voltage, current, bearing temperature and vibration are closely monitored and documented. 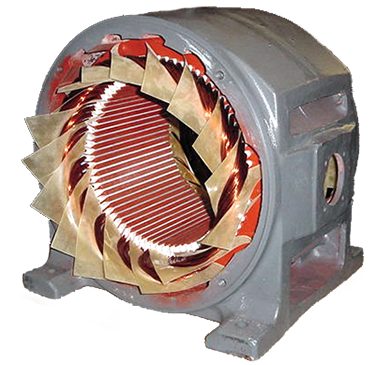 IPMR offers complete DC electric motor repair service to a wide range of industries. IPMR’s quality DC motor repair includes step-by-step disassembly, detailed inspections and measurements to identify any electrical and mechanical damage. All mechanical repairs on shafts, bearing journals, end bells, etc., are handled in-house by experienced machinists. Old motor windings are stripped in a temperature controlled burnout oven to prevent efficiency loss from lamination damage. Motors are then rebuilt using the highest quality wire, insulation, and varnish for long-lasting repairs in the most severe industrial environments. Depending on your needs, repaired motor can be tested for correct electrical and mechanical operation. During these tests, voltage, current, bearing temperature and vibration are closely monitored and documented. The need to make shafts parallel to one another, both opposing shafts (coupled) and side-by-side (sheave or pulley) is common in many industries. Proper alignment is essential to prevent wear of couplings, bearings, and ultimately, the motor itself. IPMR laser alignment provides the precision alignment of all planes for the most accurate shaft and coupling alignments in the shortest time possible. Because they produce energy savings, reduce operating costs and machine down time while maximizing productivity; variable speed drives are becoming essential components in every modern automation system. Elevators, water and wastewater pumps, boiler fans and cooling towers are just some of the applications utilizing variable speed drives. IPMR quality Variable Speed Drive repair includes step-by-step disassembly, detailed inspections and measurements to identify any electrical and mechanical damage. Depending on your needs, IPMR can help meet your servo motor repair needs including disassembly, repair and testing. Mill Motors are used for any application that requires a high ratio of peak-to-average load torques, or where a motor is required to accelerate, decelerate, or reverse rapidly under conditions of severe duty cycle operation. Mill motors are typically recommended for applications such as mills, cranes and hoists, where long life and continuity of operation are prime considerations. IPMR offers complete mill motor repair service to a wide range of industries. IPMR is an expert in handling the additional complexities and size requirements of mill motor repair. Our quality mill motor repair includes step-by-step disassembly, detailed inspections and measurements to identify any electrical and mechanical damage.